Nagasaki is situated in Kyushu, the third largest island in Japan and the most south westerly. Of course you can’t miss the Atomic Bomb Museum and Memorial, but other attractions include the restored Dutch Trading Post of Dejima, for 200 hundred years Japan’s only contact with the outside world and Glover Garden, a collection of 19th century colonial houses. There’s volcanic activity nearby, with eruptions as recent as 1990, and a mountain village of hot springs, perfect for revitalising aching bones. It was bad weather which forced American planes to divert from their original target of Kitakyushu and bomb Nagasaki instead. These days, if it were not for the memorials, museum and Peace Park, you’d never know that the quiet suburb of Urakami was completely destroyed. Over 75,000 died and 75,000 were injured but it could have been far worse – the valley and the mountains afforded some protection and two thirds of the city was spared. A smooth black stone column marks the point where the bomb exploded 500m from the ground. This was the site of Urakami Cathedral, the largest Catholic Church in Asia, and only a fragment of wall remains. 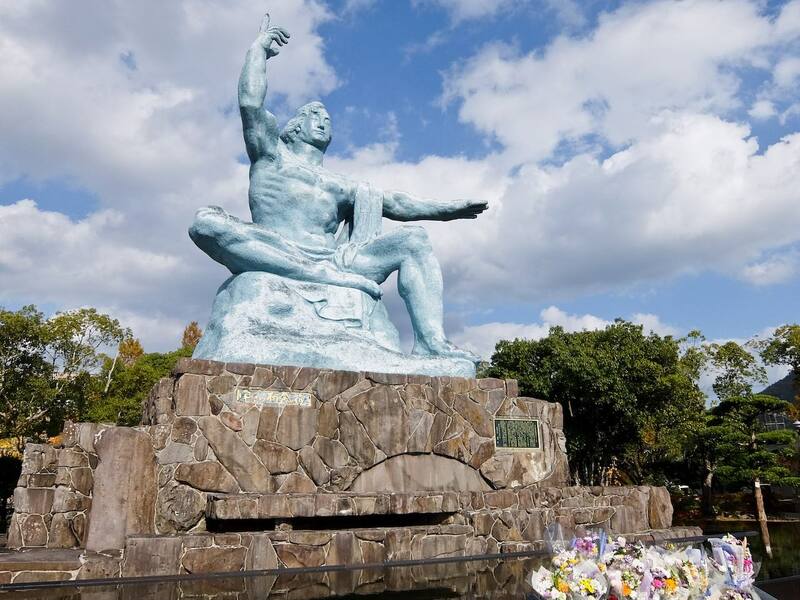 The Peace Memorial Park, close by, is dominated by sculptor Kitamura Seibō’s muscular Peace Statue, unveiled in 1955. 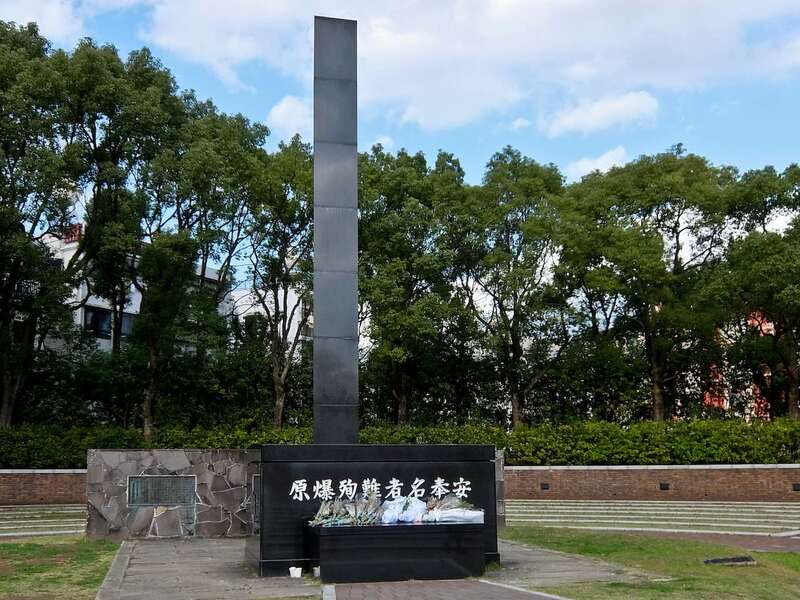 Every year, on the 9th August, there’s an official memorial ceremony remembering the dead, accompanied by antinuclear protesters determined to ensure it doesn’t happen again. To appreciate the full scale and horror of the destruction, take the circular walkway leading down to the Atomic Bomb Museum. You’re greeted with pleasant views of pre-war Nagasaki, then you enter a darkened room showing videos with stills of the dead and wounded. A display of personal objects, including a schoolgirl’s charred lunchbox and a helmet with the remains of a skull, bring home the individual tragedy. In spite of the tragedy this is a beautiful city, set on a huge bay where the shipyards are still busy and mountains frame the skies. From middle of the 16th century, for over 200 years, Japan’s only contact with the outside world was the Dutch trading post on the island of Dejima. It’s no longer in the sea, a result of land reclamation, but the buildings have been restored to their 1820’s state. There’s just one street, with the architecture a strange mix of Dutch and Japanese, and it was linked to the mainland by a heavily guarded bridge. 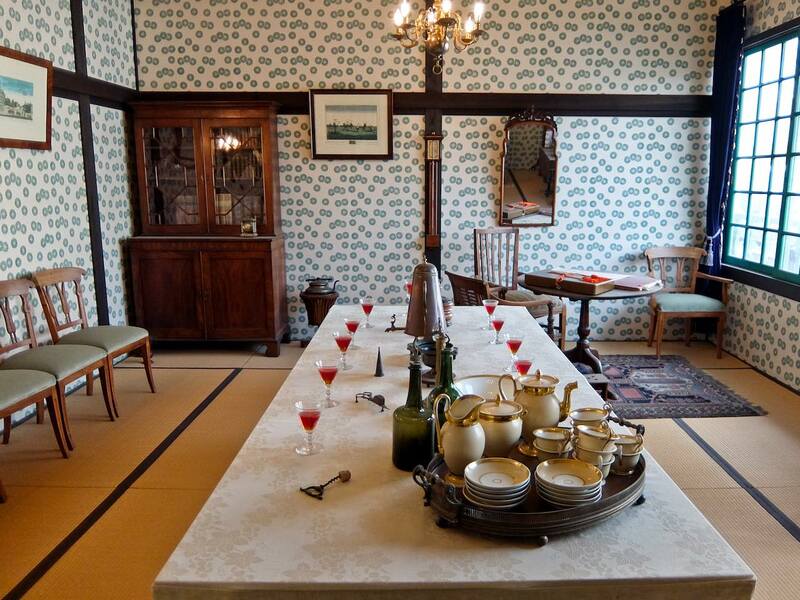 You can see their lavish lifestyle as the dining room in the Chief Factor’s Residence has a recreation of a Christmas banquet. Another part of the city’s past is found in Glover Garden where houses of Meiji-period European residents have been reassembled. It’s named after Scotsman Thomas Glover who built Japan’s first railway and helped establish the shipbuilding industry here. 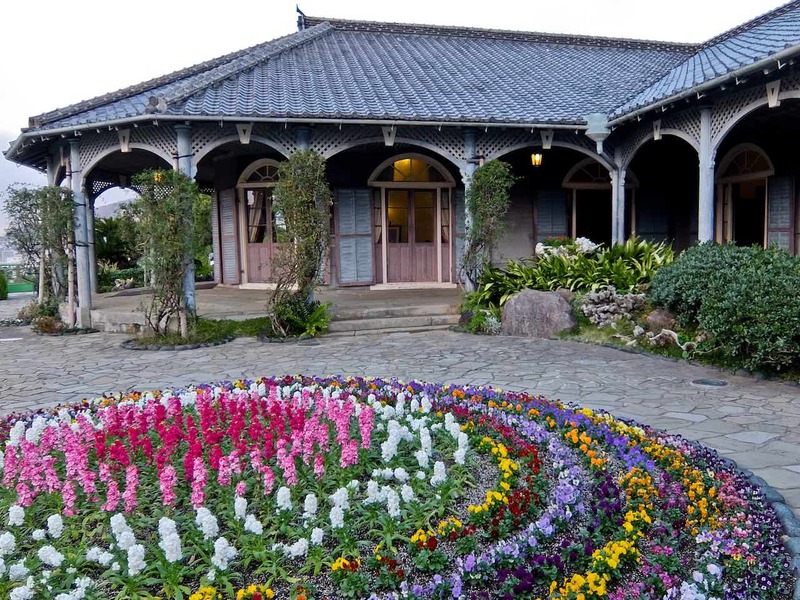 His house, the oldest Western style building in Japan, sits at the top of the hill and halfway down is a statue of Japanese opera singer Tamaki Miura who found fame in the West as Puccini’s Madame Butterfly. 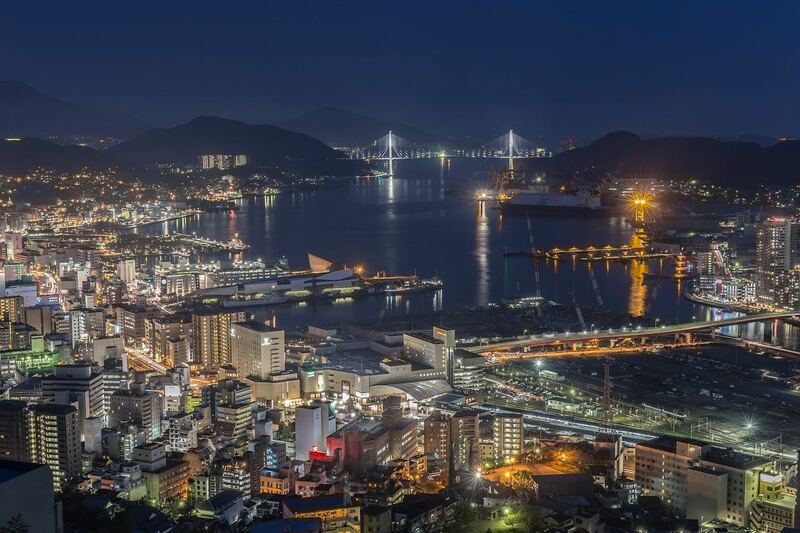 The glittering lights of Nagasaki meant it made the list “Best Urban Night View” along with Hong Kong and Monaco in 2012. A cable car takes you to the top of Mount Inasa and it’s best to get there just before sunset. The view is spectacular in the daylight but, as the sun goes down, the lights are switched on and the moon rises, you’ll probably agree it’s up there with the best. In the early twentieth century, people came from Shanghai by steamer to Nagasaki to spend time at the thermal resorts nearby. It then was a boat ride to the seaside town of Obama (no relation to the former US President) and you boarded a sedan chair to be carried up to the resort of Unzen. These days it’s an hour’s bus journey, but it’s still worth stopping here to sample the longest foot bath in Japan which runs by the sea for 105m. Unzen is still popular today, with a selection of high end hotels tastefully hidden in the woods all offering steam baths, or onsen. It feels like one of those Indian hill resorts and boasts the oldest public golf course in Japan, opened in 1913. 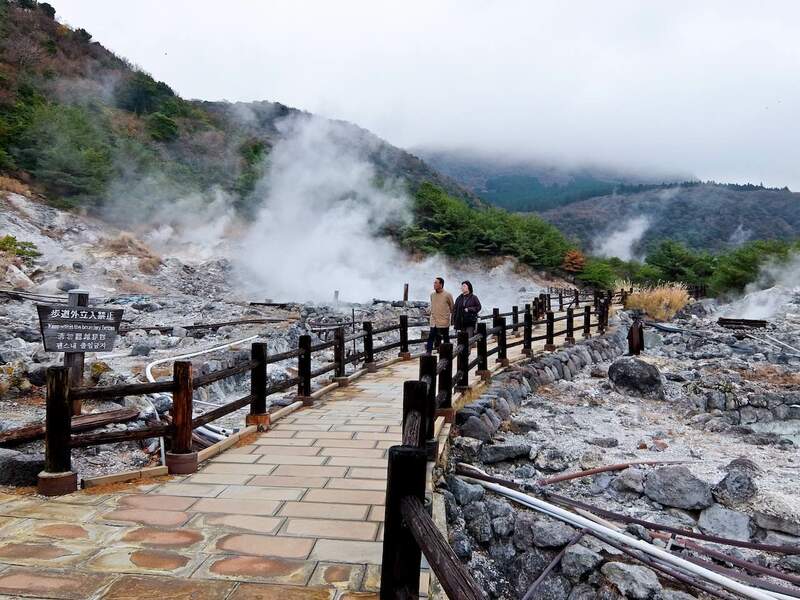 Bubbling hot springs, known as hells, gush with steam and 33 Christians were tossed into Oito Jigoku in 1630. These days they only boil eggs here, and there’s a strong whiff of sulphur. To catch the mountain air, take advantage of an extensive network of hiking trails in the Unzen National Park, all handily signposted in English. Active volcanoes tower above the town and Mount Fuken last erupted in 1990, although it’s still steaming. You can take a cable car to Myoken and get extensive views of the Ariake Sea. Time your visit for late spring when the pink Azaleas are blooming or autumn when the leaves are turning technicolour reds and yellow.